Followers of this blog are familiar with the UK media’s pattern of obfuscating, distorting or completely ignoring speeches by Mahmoud Abbas which incite violence, deny Jewish history and advance antisemitic accusations and tropes. So, we are relatively confident that no major British media outlet will so much as take note, yet alone call out, an astonishing lie told by Abbas while addressing the UN Security Council yesterday. Though Abbas once again repeated his faux history, alleging that Palestinians are “descendants of the Canaanites that lived in the land of Palestine 5,000 years ago”, that actually isn’t, believe it or not, the most ludicrous claim in the speech. Evidence showing Palestinian leaders, including Abbas himself, and government institutions praising, inciting and incentivizing terror, and promoting a culture which glorifies violence, is well-documented and ubiquitous. For starters, the PA spends an estimated $350 million a year (nearly one-third of their budget) on payments to terrorists and their families – monthly stipends which are higher when the terror act is more deadly. As detailed previously on this site, Abbas, in 2015, hailed violent Palestinian rioters on the Temple Mount, saying any blood spilled in “defense” of the holy site was “pure.” The following year, he praised, as a martyr, a Palestinian woman who attempted to kill an IDF soldier with her car. Also this month, two Palestinian sports championships were named after the Palestinian terrorist who led the terror cell that murdered Rabbi Raziel Shevach in a drive-by shooting the previous month. 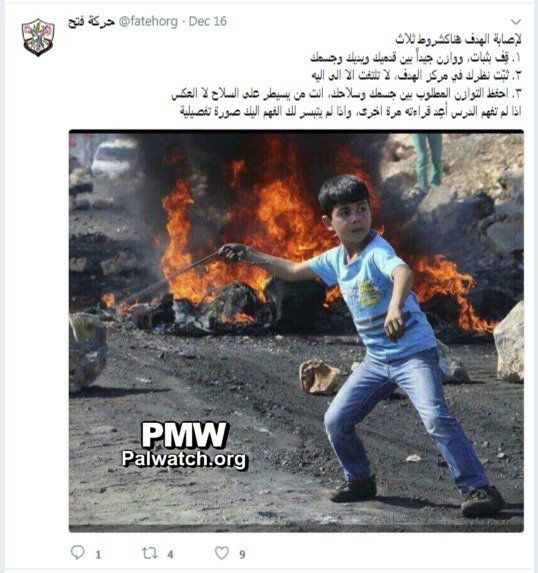 You can see PMW’s timeline of incitement here for more examples, but this one is especially disturbing: a tweet by Abbas’s party promoting a rock throwing guide for children. More evidence that shows how the PA – again, in direct contradiction of Abbas’ claim that they reject violence – inculcates their children with the belief that terrorism is noble, and martyrdom is the highest aspiration, official PA TV broadcast a children’s show which teaches kids to “follow the example” of arch-terrorist Abu Jihad, responsible for terror attacks that killed 125 Israelis – including at least 12 children. The Palestinian Authority’s official promotion of terror is consistent with a society in which such attitudes about violence are the norm, not the exception. For instance, a global poll by Pew in 2013 showed that Palestinians express the highest level of support in the world for suicide bombing “in defense of Islam”. If foreign journalists covering the region held Palestinian leaders to the same level of critical scrutiny that they consistently hold Israeli leaders to, the ten seconds of film highlighted in this post would cause a media storm – with reports and commentaries informing readers that Abbas’s UN claim, that Palestinians “are committed to fostering a culture of peace and a rejection of violence“, is simply the opposite of the truth. Michael Farmer (and others) : Under the terms and conditions of the Oslo Accords and the Jordan-Israel Treaty, the Palestinians / PA / Fatah have the right to build on Area A of Judea and Samaria (aka the West Bank) and the Israelis have the right to build on Area C. So why is the former considered to be legal and the latter to be illegal? Also, for something to be illegal it has to be breaking a law. Which law is Israel breaking? Please give its full name, the jurisdiction under which it was enacted and the date of enactment. Please don’t give me any crap about the UN or the Geneva Convention or ‘everybody says’. None of these are law-makers. Michael, I’m still waiting for you to respond to my original question. Michael, another hour’s gone by and we still haven’t seen your response to my original posting to you. The question about the legality / illegality of building under the terms of the Oslo Accords is quite straightforward as is my request for you to name the law which is being broken. Please give these your urgent attention. Many thanks. You also posted that “the UN also reminded you that you can’t gain territory through conquest.” Please provide a reference for this; where, who and when. You should also be aware that the UN can tell you anything but unless it’s a Security Council Resolution passed unanimously, it has no weight whatsoever: it is merely an opinion. But stop trying to distract and get on with answering you original posting. It’s a new day and I still haven’t heard from you. Why is that? Surely it’s not because you have no answers to my questions. I read your comments and they imply that you are so knowledgeable. Sadly, I’m beginning to think that you are just another ignorant, prejudiced Israel0hater and antisemite. Please prove to me that I am wrong. By the way, I should have added that officially these Arab states are still at war with Israel as no peace treaty has been signed by the parties involved. Now please answer my original question and give the name of the law to which you are referring when you say that Israeli building on Area C is illegal. Anyone who claims it’s ‘illegal’ is either a liar and/or stupid and ignorant. The BBC, for example, is both. I see that some idiot has marked me down. I also see that s/he doesn’t have the courage to explain in what way this is ‘illegal’. The word “PEACE” has become the most trashed word in the dictionary. So too “Justice” and “Progressive”.